"I named the album Life Changes because my life has never changed this much in a short span of time," he says. "From seeing the success of a song like 'Die a Happy Man' to putting out my third album to going on my first headlining tour to having two children, both under two years old… I thought the title of the album was a good representation of what is happening in my life right now." 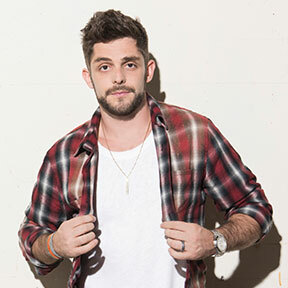 Much of the album's material was written on the road, while Thomas Rhett toured his way across America in support of his platinum-selling second record, Tangled Up. Released in 2015, Tangled Up marked a turning point in his career, spawning four Number One singles and one Grammy-nominated smash: "Die a Happy Man." A tender, personal song written about his wife, "Die a Happy Man" topped the charts for six weeks, earning awards from the CMA, ACM and Billboard Music Awards along the way. It was an eye-opening experience for Thomas Rhett, who'd rarely written something so intimate before. Although intensely autobiographical, "Die a Happy Man" still tapped into something widespread and universal, becoming the biggest hit of his career. There's plenty of autobiography on Life Changes, too. Thomas Rhett sings about his own adolescence in "Sixteen," a nostalgic song about a teenager's desire to grow up…only to miss his teenage years once adulthood is finally reached. "No matter if you're 10 years old or you're 80 years old, I think you can always find an identity within the verses and choruses of that song," he says proudly. The album's title track tells a wider story, opening with his days as a struggling songwriter before moving through the various life changes — his marriage to his grade-school crush, the adoption of the couple's first daughter, the achievement of his lifelong musical dreams — that have unfolded since then. Both songs tell personal stories, but listeners can see their own lives reflected in Thomas Rhett's music. After all, who hasn't fallen in love as a teenager? Who hasn't looked back fondly on their high-school years? His stories are so compelling because they are our stories, too. Reynolds and Barnes are just two of Thomas Rhett's collaborators on Life Changes. He co-produced the album himself — a first, with a hands-on approach to the album's layered arrangements — and he reached out to number of new names and familiar faces for additional help. Guitar hero Dann Huff, who spent the '80s performing alongside Michael Jackson and other legends before transforming himself into a hit producer, joined him for the majority of the album. Jesse Frasure, co-producer and co-writer on much of Tangled Up had a hand in multiple new tracks including the current single “Unforgettable.” Joe London, also with co-writer/producer credits on Thomas Rhett’s sophomore effort and had a hand in writing its smash hit “Die A Happy Man,” also returns as a co-producer and songwriter. Julian Bunetta, known for his work with One Direction and other pop acts, made multiple appearances, too, including co-writing and co-producing credits on Life Changes’ chart-topping debut single "Craving You." Thomas Rhett teamed up with songwriters from across the country, working with L.A.-based hit makers one minute and fellow Nashvillians like Shane McAnally and Ashely Gorley the next. The goal was simple: to stretch his limits, widen his circle, and create the best music possible.